It's a bitterly cold morning in Horseshoe Park. Snow has been falling over Rocky Mountain National Park most of the night. As sunrise approaches, the fog and clouds broke long enough to illuminate the skies with warmth and color the frosty landscape. 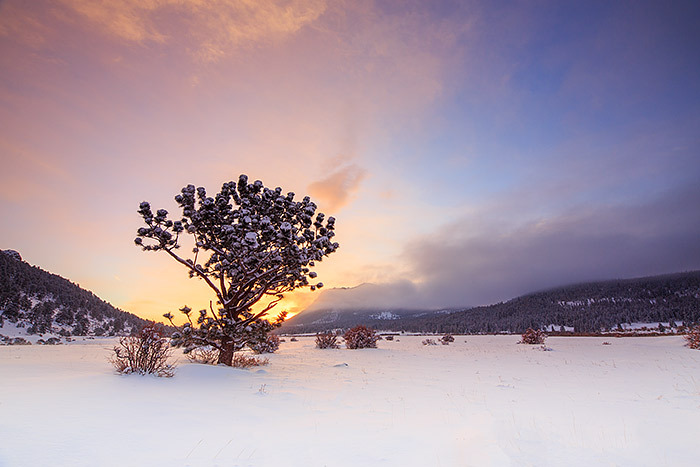 A small pine presides over this beautiful sunrise as the sun begins to rise behind Deer Mountain. Photo © copyright by Thomas Mangan.